Linking the development of enhanced oil recovery in the North Sea to low-carbon electricity can bring significant benefits to the wider UK economy while accelerating carbon storage and providing the most cost-effective pathway to UK decarbonisation targets, a new report proposes. A comprehensive new analysis by a Joint Industry Project has been made of injecting carbon dioxide (CO2) derived from low-carbon electricity production and industry to enhance oil recovery from existing North Sea fields (CO2-EOR). The report shows that a synergy between CO2-EOR and Capture and Storage (CCS) could be the driver for developing both technologies in the UK Continental Shelf. Part of the CO2 that would otherwise go directly to dedicated storage in CCS projects could be used to drive CO2-EOR, bringing significant benefits to the wider UK economy - including extending the producing life of the North Sea, reducing imports of oil, maintaining employment, developing new capability to drive exports, and additional direct and indirect taxation revenues. This approach could also provide the most cost-effective way to accelerate an energy transition between 2018 and 2030 to meet UK Committee on Climate Change decarbonisation pathways, say the authors. "North Sea oil and gas are facing an existential cost challenge, and at the same time the UK is struggling to fund its electricity decarbonisation clean-up. The beauty of this new analysis is that it shows how to help develop big projects in the power industry, while also supporting a transition of the abilities and profits from offshore hydrocarbons into new, sustainable jobs." A business demand is created, which drives the sequential construction of CO2 capture projects - reducing the costs associated with CO2 supply and enabling cheaper low-carbon electricity. CCS by this route, with secure CO2 storage already proven, would develop more rapidly and protect the onshore UK economy and industry from increasing carbon prices. Through accelerated CCS deployment more CO2 is abated, more quickly, than by any other route, and this includes emissions from the additional oil produced. Public subsidy towards the cost of a low-carbon transition would be greatly reduced, and CO2-EOR may even be profitable across the whole economy. Investment in CO2-EOR has a national return of up to 7.
x, which is much larger than rival energy opportunities. 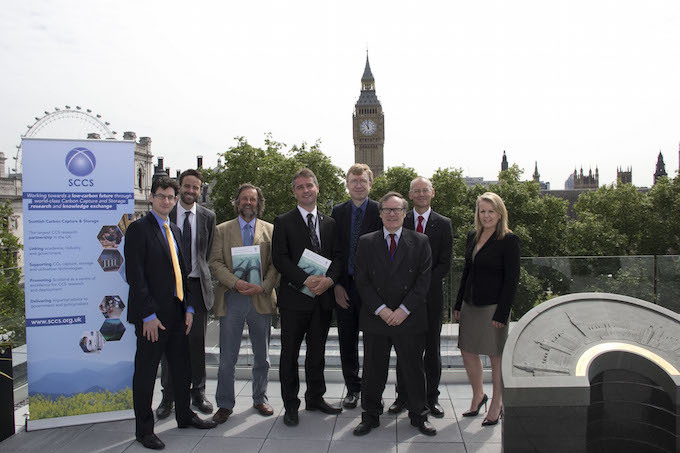 However, the report points to a lack of clear supportive legislation and fiscal regimes for CO2-EOR in the UK. New supportive regimes are needed for CO2-EOR projects, similar to existing brown field or development allowances, and these must make investing in CO2-EOR in the UK competitive with the alternative global investment opportunities. CCS is one of several routes to low-carbon electricity and directly reduces fossil fuel use emissions. In the transition to a UK low-carbon future, fossil fuels with carbon capture will become essential in the generation and industry mix. CCS has the benefit of providing power on demand, independent of the external conditions which impact wind, tidal and solar. CO2 captured in CCS projects can be publicly subsidised and sent to permanent geological storage deep beneath the North Sea. Alternatively, additional oil production using CO2-EOR, can provide the commercial finance, equipment infrastructure, and project management experience needed to develop lower cost CO2 capture and secure storage, which has lasting benefit to UK low-carbon electricity. CO2-EOR is a proven technology to increase oil recovery, and simultaneously stores CO2 permanently in the subsurface. Two technically similar projects have been commercially successful in the North Sea offshore since 1998 and 2002, by injecting miscible methane gas. This gives high confidence that CO2-EOR is achievable in North Sea oilfields. Detailed computational simulations of CO2 injection to oil reservoirs has confirmed viability of injection and oil production. Measurements from existing CO2-EOR operations demonstrate secure CO2 storage into the far future. A carbon accounting balance of carbon produced and carbon stored shows that CO2-EOR continues to enable â€œgreenâ€ low-carbon electricity produced by CCS. In addition, CO2-EOR stores significantly more CO2 before 2050 than the present publicly funded pathways of CCS. CO2-EOR enables production of a limited amount of additional oil with less carbon cost than any other method. CO2-EOR can be economic if the CO2 is provided to EOR projects at a near zero transfer price, and if fiscal structures are introduced that are similar to existing brownfield and cluster allowances. This can encourage further development of existing fields, by ensuring that CO2-EOR projects surpass international â€œhurdle ratesâ€ of profitability to successfully compete for funding by oil and gas companies. Financial leverage into the whole-UK economy is conventionally measured as GDP or by an Economic Multiplier (EM), which measure the ratio of economic return to Government Input. Calculation of illustrative returns show, for UK Government input into CCS linked to CO2-EOR, this ratio = 7.2 EM; compared against simple CCS fitted on coal = 2.6 EM; compared to offshore wind = 3.3EM. Thus every Â£1 invested in CO2-EOR could generate a return of up to Â£7.2, which is 2.2 to 3.2x larger than rival clean energies. This CO2-EOR pathway compares well to some independent propositions for future CCS pathways in the UK. The Energy Technologies Institute (ETI) envisage an optimal 60Mt CO2/yr injection by 2030. The Committee on Climate Change â€œcore decarbonisation scenarioâ€ of the 4th carbon budget envisages 52Mt/yr CO2 capture by 2030 (Element Energy 2013). These can both be met by a UK CO2-EOR market, which develops commercial CCS projects every year from 2019-2030. CO2-EOR strengthens the case for Government to invest in CCS, and reduces the level of investment required by providing part of the offshore transport storage capacity and storage certainty as an intrinsic part of EOR. The CO2-EOR Joint Industry Project was led by Scottish Carbon Capture and Storage (SCCS) with funding provided by the Scottish Government, Scottish Enterprise, 2Co Energy, Nexen and Shell. Please note that the project findings are those of the authors and do not necessarily reflect those of the project sponsors.